David Wells Roth is widely recognized for his series of Judicial Portraits as well as for his comprehensive portfolio that also includes many other notable historical paintings, vibrant urban and street scenes, portraits, figures, still life’s and coastal land/seascapes from Europe and America. Born in Florida, Roth gave signs of precocious visual and aesthetic observation. At age four he began drawing lessons and studied under his parent’s guidance and at various museums to learn the basics of art. Making his first oil painting at age 10, the tonalities he discovered and played with informed his palette. His sensitive/intuitive portraits of Abraham Lincoln show astounding acuity and graphic skill. Roth’s passion for drawing was sparked by his parents (native New Yorker’s) insightful use of city street scenes for teaching perspective. The young boy was fascinated with magical illusions of 3-D space transforming the flat surface of the paper. Roth was also inspired and informed by his mother, an amateur artist who studied under Abstract Expressionist painter Robert Motherwell at Hunter College. 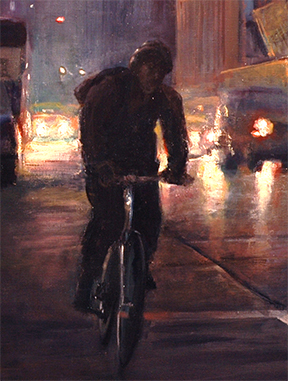 In high school Roth’s visual and emotional impressions of the isolation and dismal conditions of his parent’s South Bronx (NYC) neighborhood were interpreted and conveyed in his drawings and paintings; their power was further increased by his studies of the urban art of Wayne Thiebaud, Richard Diebencorn, Richard Estes and Edward Hopper. A Ford Foundation scholarship in 1975 supported the next stages of Roth’s career at Boston University where he earned his Bachelor of Fine Arts in painting. In 1980, Right after college he ventured to NYC for two years and refined his “peoplescapes” within the city and other urban genre. Times were tough for fledging artists; Roth often lived in his car while he painted and sold views of Central Park and his personalized New York City street documentae to passersby from a portable French easel. A fortuitous opportunity facilitated Roth’s next move to France and Italy for fifteen years. While struggling financially in NY, a French family invited the young artist to live with them in their home in Fontaine de Vaucluse in the South of France and offered the use of an old Renault for a few months in exchange for one of his New York paintings. The light and energy there ignited his paintings of the region around Avignon over the following four months. A relative of this sponsoring family offered to barter their extra apartment in the Paris suburb of Le Pre St. Gervais for the next two years in exchange for one of those works. In the mid-90’s Roth commuted from Paris to Boston for a commission to paint a series of historically referenced works for The Union Oyster House, (America’s oldest continuously operating restaurant, and historic landmark in Boston). The series centered around the lives of Isaiah Thomas (Boston Revolutionary War publisher) and Daniel Webster and included images of early Bostonian History. These, as well as the insightful brilliant portrait of Daniel Webster remain on view in the Society’s Heritage Room and displayed in its sidewalk windows. Upon returning to the states in 1997, Roth participated in group shows in the Allan Stone and DFN Galleries in New York and had solo exhibitions of his work at the American Institute of Architects in Boston and the Whistler House Museum in Lowell, MA. He was a finalist in the Blanche E. Coleman Award Competition. The Boston Public Library recently acquired several of Roth’s drawings and watercolors for its print and paper collection. Coastal themes have been a strong focus of Roth’s repertoire since his early years in Florida when the family home was within walking distance of the Gulf of Mexico. While living in France and since returning to the United States, he has made painting trips to Cape Cod and Maine part of his regular painting routine. In 2006, as Roth was finishing a sensitively aware, humane portrait of the Hon. Judge Richard Stearns (that now hangs in the John Joseph Moakley US Courthouse, Boston), the huge success of this portrait was announced throughout the 1st Circuit which includes Puerto Rico. The Chief Judge of Puerto Rico’s Federal Court was just then planning a project to have portraits painted of all 34 judges in the history of Puerto Rico’s Federal Court. The Commission for the total project was awarded to Roth. This historical series now hangs in its entirety in the Atrium of the Clemente Ruiz Nazario Courthouse, the main federal court in Hato Rey, San Juan. Rhode Island School of Design, Pre-college studies program.